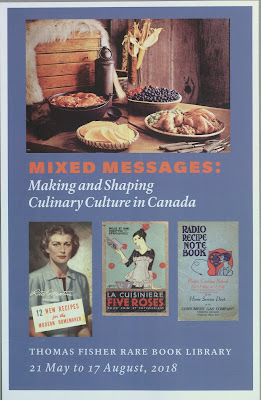 Today's guest post about the current exhibition on Canada's culinary culture comes from Irina D. Mihalache. We welcome you to learn more about the exhibit below and encourage you to visit. 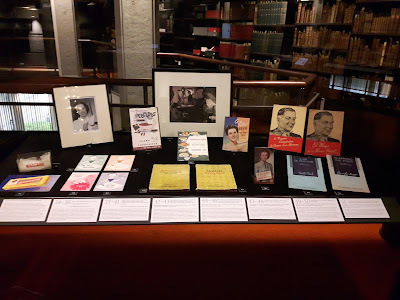 On May 24, 2018, we celebrated the opening of “Mixed Messages: Making and Shaping Culinary Culture in Canada”, at Thomas Fisher Rare Book Library at the University of Toronto. 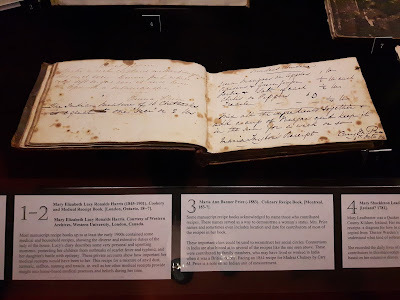 This exhibition takes a look at how the culinary culture of Toronto and surrounding areas was made and shaped by those who participated in or were excluded from the making and using of culinary materials. 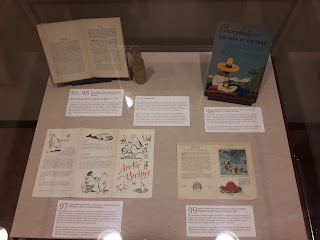 On display we have some delicious objects from the 1820s to the 1960s. Many of the objects on display have been donated by Mary Williamson, an extraordinary collector of culinary materials from Toronto. Thanks to her, we were able to work with numerous treasures from Canada’s culinary history: community cookbooks from the turn of last century; wartime cookbooks; commercial cookbooklets; historic women’s magazines. Alongside these objects, we also selected culinary manuscripts, home economics manuals, photographs and women’s magazines from the Fisher’s existing collections. As one of the curators mentioned in her remarks at the exhibition launch, “it takes a village to plan an exhibition”. This couldn’t be truer of this project! In this post, I celebrate the collaborations that made this exhibition possible. The process of a collaborative curation was rewarding but also challenging, as people with different academic backgrounds, perspectives on culinary culture, and expertize had to negotiate their differences and produce coherent and harmonious content. I believe that in the end we found power in our differences and worked very smoothly together. Throughout the collaborative process, we came to think of the many women whose stories we tell in the exhibition as our project partners. They shared their stories through the diaries they kept, cookbook they wrote, recipes they created, and cooking courses they taught, and we were lucky to be able to present their works. The project started, about three years ago with a team of three curators, with different backgrounds: From the Fisher, Liz Ridolfo, a librarian who specializes in culinary materials; from McGill University, Nathalie Cooke, a literature professor and also dean of archives and rare collections; and, from U of T’s Faculty of Information, a museum and food studies scholar (myself!). Faced with a rich and diverse collection, we wanted to tell the story of culinary culture in Canada with a focus on the agency of the women, some well-known, such as Kate Aitken, and some less familiar. We asked ourselves: who are the makers of culinary culture in Canada? Who are the users? Who had the opportunity to contribute to culinary culture and who did not? What communities were visible? How did Canada’s colonial past factor into the story that Canadians crafted about their culinary identities? All these questions motivated us to think less about a definition of Canadian culinary culture and more about the processes through which culinary cultures are formed, negotiated, resisted and communicated. The main gallery of the exhibition is organized around eight display cases, each focused on one type of material culture (e.g. community cookbooks, women’s magazines, etc. ), and sets the main themes of the exhibition. 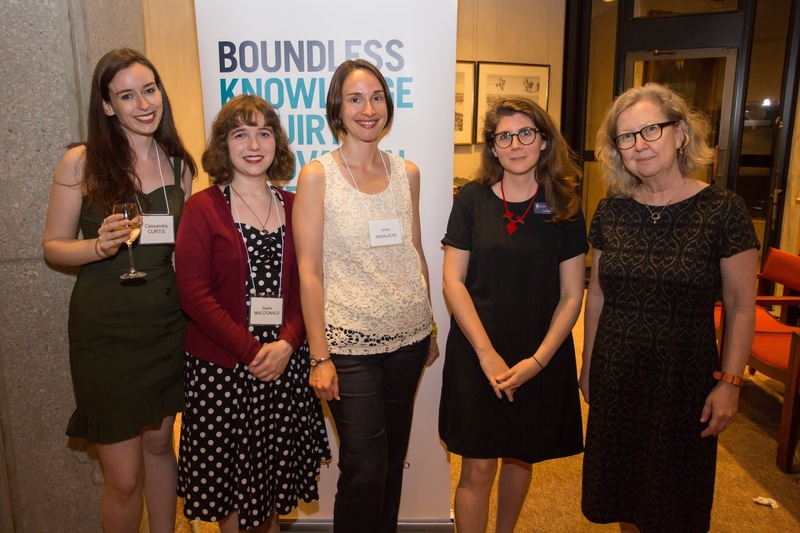 Graduate students curate with difficult history, culinary technology and…smells! 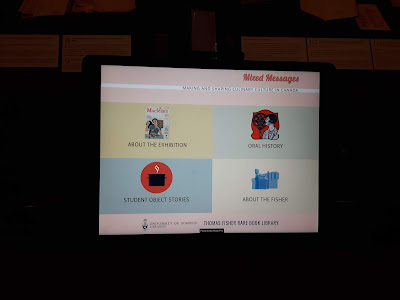 As we started work on the exhibition, we realized the opportunity to graduate and undergraduate bring students on board and to get them involved with various aspects of the exhibition. The Maclean Hunter Room, the lower level exhibition gallery, is entirely curated by two graduate students from the Faculty of Information’s Master of Museum Studies program: Cassandra Curtis and Sadie MacDonald. 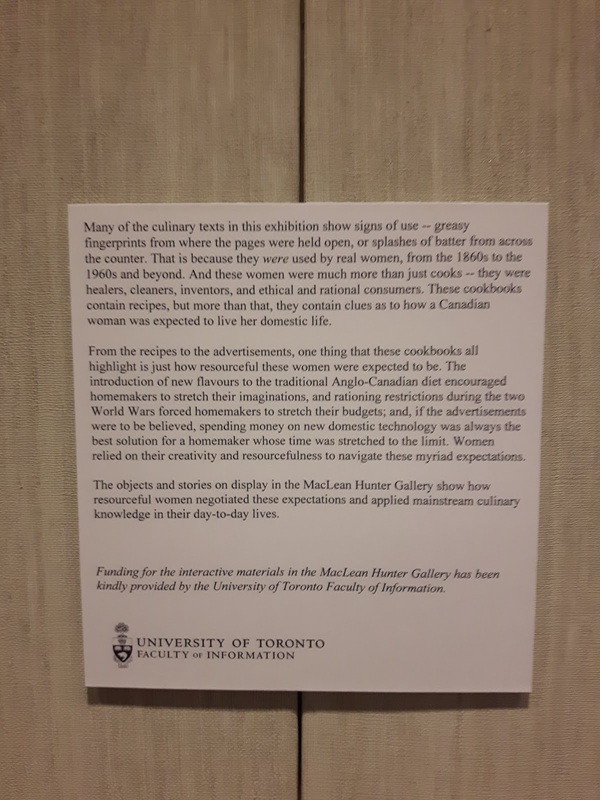 The duo worked with the themes introduced in the main gallery in order to provide more specific examples related to women’s resourcefulness, technological innovations and representations of migrant and indigenous foodways. They even managed to bring in smells! Three smells boxes provide a sensorial engagement with the materials. The flavors “on display” are coconut, pineapple and curry, which are very common in Canadian recipes as early as the 1830s. 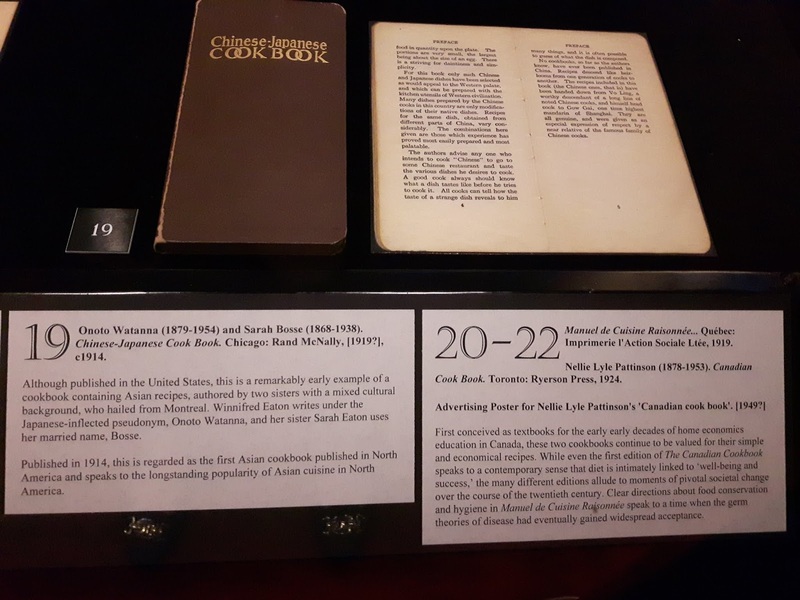 Forty seven graduate students from a Museum Studies graduate course I taught in Fall 2017 were invited to contribute stories about culinary objects to the exhibition. Each student was paired up with an object, which they researched and interpreted, resulting in some fascinating stories, included on two digital stations in the exhibition. Every exhibition has a story of its creation and I am excited that I was able to share this story with you! If you are in Toronto and in need of a culinary break, stop by! 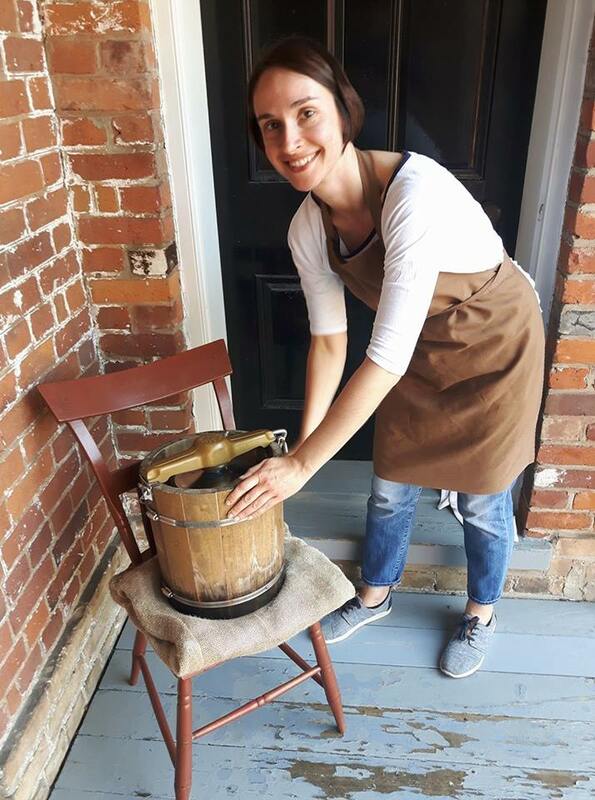 Irina D. Mihalache is Assistant Professor in Museum Studies at the Faculty of Information at the University of Toronto and member of the Culinaria Research Center at the University of Toronto Scarborough. At the Faculty of Information, where she was hired in 2013, she teaches courses on Museum Interpretation, Global Museum Cultures, and Introduction to Exhibitions, Interpretation and Communication. 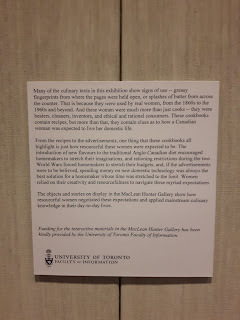 She also teaches an undergraduate course on Food and Material Culture in the U of T’s material culture program. 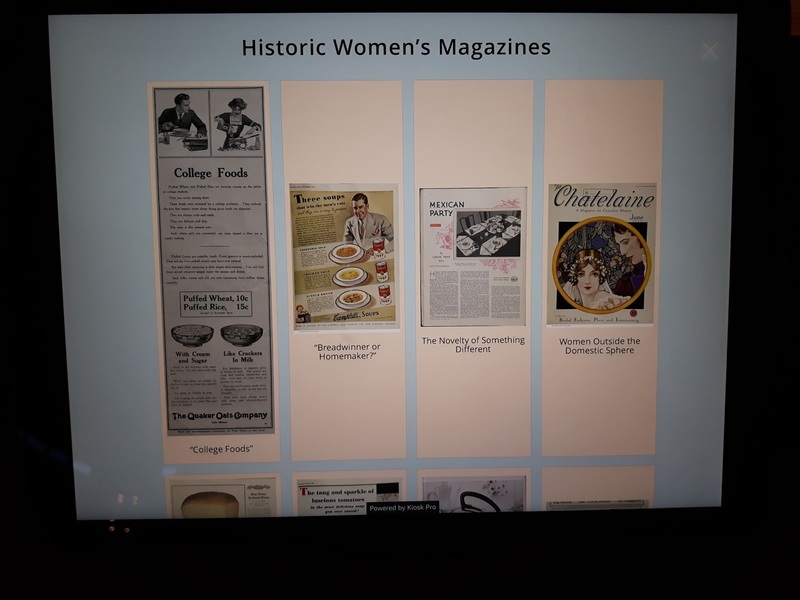 Prof. Mihalache researches how (and what) people eat in museums; the history of women’s committees in art galleries in North America; and historic women’s magazines and recipe competitions in Canada. On these topics, she wrote several articles and chapters in food and museum studies journals and edited volumes. In 2016, she co-edited the volume Food and Museums, the first to explore the depth of connections between the two. In museum studies, her main area of interest is museum interpretation and she is very interested in how collaborations with diverse communities can shape the work of storytelling in museums. She has done collaborative work with the Toronto Ward Museum, the city’s new museum of migration and the Fort York National Heritage Site.